Yemen is a failed state devastated by fighting, with thousands of civilians killed by a strong jihadist presence and widespread suffering. It has made very few headlines. 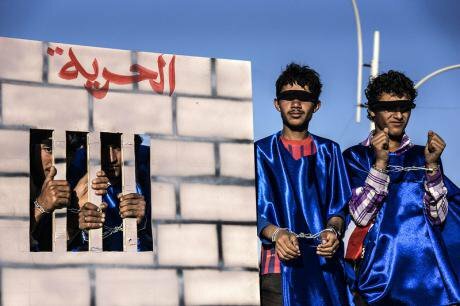 Demonstrating for the release of detainees in Yemen's youth revolution, 2013. Demotix/Luke Somers. All rights reserved. Yemen has never been a staple of the western media. It did pop up on the news when in a leadership shift à la Arab Spring, Ali Abdullah Saleh stepped down in February 2012 as president after thirty-three years as strongman. In January this year Yemen came back to our screens when the Houtis, a Zaidi Shiite group, seized control of the government. In response, a Sunni Saudi-led, US-backed coalition started bombing the south of the country in March to neutralize the insurgents. Amidst the confusion and vanished institutions, Al-Qaeda in the Arabian Peninsula (AQAP) and the Islamic State (IS) affiliate in the region strengthened their foothold in this corner of the Middle East. This situation has been worsened by a maritime blockade engineered by the Saudi-led coalition to cut supplies to the Houtis. Yemen is now hardly importing any food or fuel, the latter essential to keep generators, ambulances and water pumps working. After a visit to Yemen in August, Peter Maurer, President of the International Committee of the Red Cross, said, “Yemen in five months is like Syria after five years […] the world needs to wake up to what is going on.” Yet media coverage of Yemen, in particular of its dire humanitarian situation, remains shamefully scant. But why is that? The fact that one of the world's poorest and hungriest countries is being fatally hit by man-made mayhem has failed to make a sustained dent in the western media in the way that similar conflicts did. The 2011 Libyan civil war that overthrew and killed Gaddafi, or Israel’s military operation against Hamas in the Gaza Strip in the summer or 2014 – more civilians have already died in Yemen than did in Gaza - generated far more media indignation, or, "sense of moral urgency,” as Sara Roy, Harvard associate of its Center for Middle Eastern Studies, puts it, than the Yemeni conflict has done or will ever do. Given the critical lack of journalists and diplomats, the hundreds of aid workers active in the country are a crucial source of updates from the field. UN agencies and charities like the International Federation of Red Cross (IFRC) and Médecins Sans Frontières (MSF) maintain a significant presence. In late October, news of a bombarded MSF-run hospital, the only operational facility in the North-western district of Haydan, by Saudi-led airstrikes emerged thanks to the condemnation of the organisation’s aid workers. Occasionally, charity workers use main stream media channels to shed light on the dreadful situation in war-torn Yemen. “It is tragic that, even before the current crisis began, 61percent of Yemenis needed humanitarian aid. That went on for around a decade with hardly any coverage in the media,” argues Karl Schembri, Regional Media Advisor at the Middle East Regional Office of the Norwegian Refugee Council. Such media apathy is reinforced by the aloofness of the western political class, in particular “by the lack of engagement from leftist politics [indeed displayed with Palestine],“ as Sophia Dingli, a lecturer in International Relations at the University of Hull, maintains. Finian Cunningham, a contributor writer for RT, argues that given that the US, Britain and France provide the Arab coalition with intelligence and logistics "the onus” is ”on [CNN, BBC and France 24] because their governments are implicated in grave crimes.” The mainstream media’s lack of interest in this conflict cannot be attributed to the irrelevance of the country. But the potential role of Yemen as a supplier of oil to the west; the control of the key port of Aden, gateway to the Red and Arabian Seas; the country’s proximity to volatile Somalia; and Sana'a’s strategic position in the Sunni-Shiite struggle make Yemen an important territory for western and regional powers to rein in. The wholesale return of IS to the headlines following the Paris massacre will soon bring Yemen to the attention of commentators. The bloody chaos engulfing the country and the increasing grievances unleashed by the Arab invasion guarantee sectarian and jihadist volatility for years to come. The media should play a proactive part in warning our leaders that another Syria and another Iraq are in the making.